MyPhone Rio 2 Fun and MyPhone Rio Fun 3G have been quietly released by the local company earlier this week. These handsets promises better specs and affordable prices. 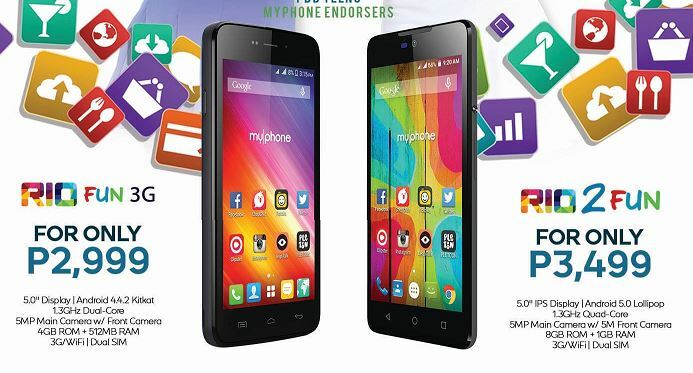 MyPhone Rio 2 Fun and MyPhone Rio Fun 3G have been quietly released by the local company earlier this week. The former is basically the successor to the popular Rio Fun that has been introduced last year; while Fun 3G is somewhat the 3G version of the 2014 Fun handset. The MyPhone Rio 2 Fun brings in lot of improvements from last year’s version. It comes with a quad-core CPU clocked at 1.3GHz and 1GB of RAM. Front and back cameras both packs a 5-megapixel sensor with 8GB of expandable internal memory for you to pile up your multimedia files. On the other hand, the MyPhone Rio Fun 3G comes with minute enhancement compared to the original Rio Fun. Aside from the fact that it has 3G connectivity, it comes with a better 4GB internal memory, 5MP rear camera, Android KitKat and 1800 mAh battery.